NASA will hold a press conference Friday (Nov. 2) to discuss the latest discoveries from the Mars rover Curiosity. The press conference, which begins at 1 p.m. EDT (1700 GMT), will "provide an update on Curiosity's studies of the Martian atmosphere," according to a NASA media advisory. That may mean researchers have their first atmospheric results from the rover's Sample Analysis at Mars instrument, or SAM. SAM can identify organic compounds, the carbon-containing building blocks of life. 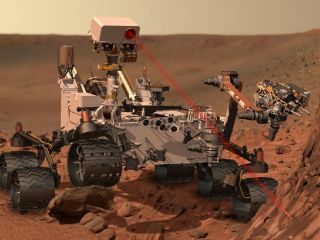 While SAM has yet to analyze its first soil sample, Curiosity has already sniffed the Red Planet's air several times in a search for methane, a gas commonly produced by organisms here on Earth. NASA will stream audio and visuals of the news conference live; you can follow along here. The 1-ton Curiosity rover landed inside Mars' huge Gale Crater on Aug. 5, kicking off a two-year mission to determine if the Red Planet could ever have supported microbial life. The robot is currently investigating a sandy area called "Rocknest," where it has been trying out its scooping and soil-sampling gear for the first time.